I wasn't quite sure where Ukrainian pianist Lubomyr Melnyk was headed with his set-opening speech about a "terrible, insidious religion." Turns out, the "evil" religion he wanted to warn us about was science. "There is no truth in science," he said. "Lie, lie, lie." Instead, Melnyk wanted us to lose ourselves in what he called "the mystery of sound." The spiel bothered me, and not just because I disagree with its fundamental premise of "science = evil." It's that I don't believe music's majesty is in any way muted or lessened simply because we understand it as interactions between molecules (as Melnyk dismissively described it) versus some sort of divine, unknowable dialogue. Music's beauty comes from its natural order, in the way the two right notes collide or fold in on one another in sequence and trigger a deep emotional reaction within ourselves. Maybe you believe that natural order is heavenly ascribed; maybe you believe it's simply the science of sound. So what? Isn't it worth reverence either way? The sort of music that the OBEY Convention festival books typically aims to defy music's natural order — or, at the very least, show it a healthy disrespect. Dissonance often reigns, with even those performers wielding more traditional instruments like saxophones and violins aiming to find some noise between the notes. That's hard to do on a grand piano: The 36 black keys and 52 white ones almost confine a player within music's order, demanding respect, challenging the pianist to see what they can do within the boundaries. What Melnyk does within those limits is pretty extraordinary. With his "continuous piano music" technique, his hands dash across the keys, leading the climax of his pieces to sound as if the entire instrument is being played all at once. Rather than distortion or digital looping, he achieves cacophony through the sheer accumulation of notes he's able to play in a short period of time. 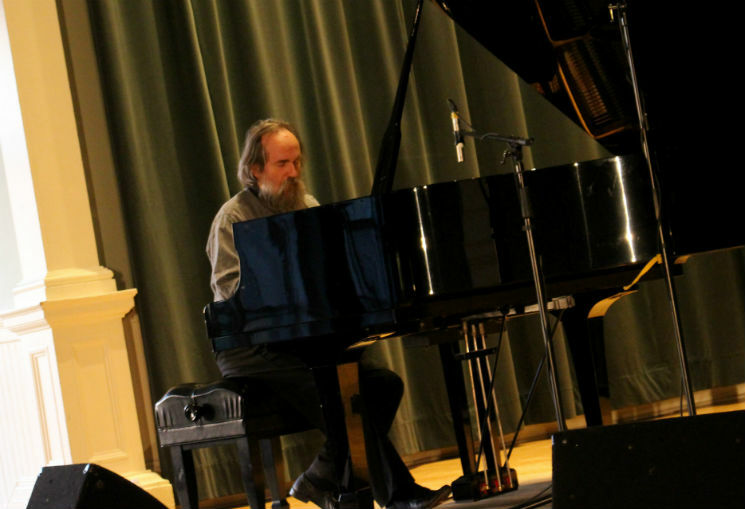 Two of the four pieces he performed at the Maritime Conservatory were written for two pianos (including the 30-minute-plus "Windmills" that closed the night), and Melnyk played along with performances of the accompanying part he recorded earlier in the day. He made an impressive enough noise solo on a piece like "I Love You," but hearing the dual piano fluttering in the climax of "Butterfly" accumulate sound until it was like an entire swarm of butterflies buzzing through the room was awe-inspiring. At the end of each piece, Melnyk let the final reverberations fade out as he sat silent at the keys, almost as if in prayer. The crowd — regardless of their religious beliefs, or their attitudes towards science — joined him. Reverence was well earned.